For those that aren’t familiar with Etsy, it is a website that is dedicated for selling handmade a vintage items. They also had a section called Alchemy, which was an area to request an item custom made for you. Etsy decided to take it down and revamp it, with no scheduled timeline to bring it back. Most of my sales on Etsy have been through this section, or from repeat customers. Now it is gone (for who knows how long) leaving no way for people to seek out custom items. A group of Etsians have broken out and are starting up a website dedicated to custom requests called Uniimi.com (U Name It, I Make It). The website is still under development but they are moving fast on it. So if you are in the need for a custom item, or gift idea, check them out! Of course you can always email me if you need some custom woodworking done! Also, I have a custom job coming up that has been something that I have wanted to make for myself, but now need to make for someone else. I plan on making a series of post showing the process of going from design to final product. So check back to see what it could be! I’m trying to maintain a more regular shop schedule this year so I can make sure I have time to build up some inventory, and still keep a healthy work/life balance. I would like to try and do some art shows, but don’t have nearly enough items on hand to display. Don’t look for me out there this year, maybe in 2012 though. Most of my work has been on a custom order basis, which is great to avoid buying things that I don’t need or that people don’t want. But I also want to appeal those that need to see before they buy… novel concept, I know. So between custom orders and new idea of things that I want to build, and trust me I have no shortage of ideas…., I’m trying to start the year off with a more regular schedule to build up items… and the snow is ruining it! Tripling commute times and making me shovel and snow blow it away takes away from my shop time! Hopefully I can get back on track next week and start to crank out a few more things. Wish me luck! If anyone knows of some good art shows in Michigan that I should try to get into, let me know. Starting off this New Year I thought that I would try and give a little different feel to the website by adding a blog to let you all out there get to know us better and understand the passion that we have for fine woodworking. Also, maybe you will get to know us a little more and actually like the people that you are planning to purchases from. In this picture is me, Derek. My wife is a little camera shy, so in her place is my second love…. 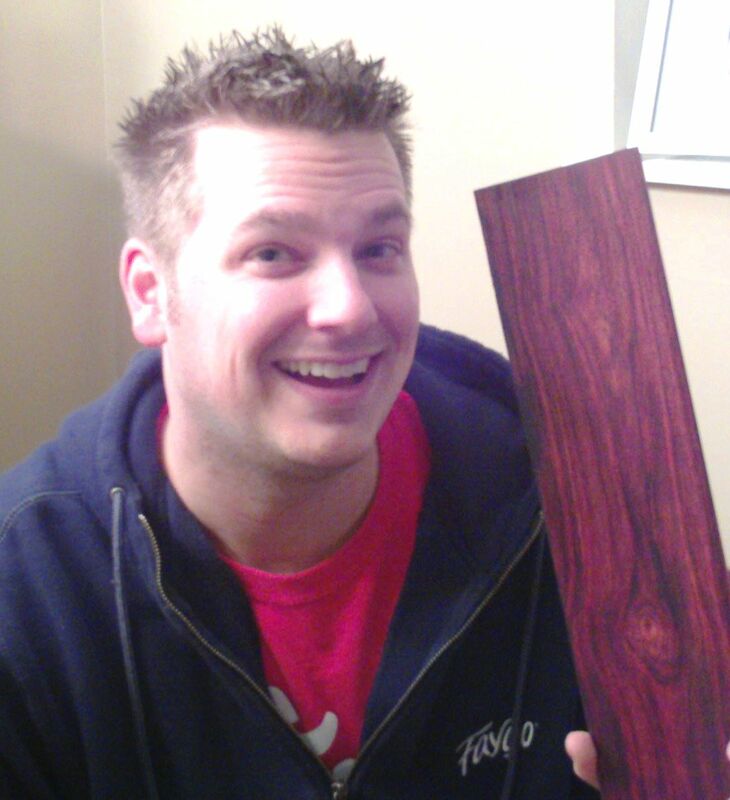 a piece of exotic Cocobolo. This is the wood that I first fell in love with when I started woodworking. This picture does not show the detail of the streaks of red, yellow, and orange… shocking that something like this is naturally produced! Cocobolo is my favorite exotic wood, and my favorite domestic wood is Maple Burl… maybe I’ll have a picture of that next time. So the moral of the story is that I want all of you to see who is behind HandmadeWoodGifts. I like to refer to myself as the “creative mind” and my wife as the “voice of reason”. I hope to update the blog on a regular basis so that all of you out there in cyberland can get to know us and see some of the projects that we are working on… maybe we will feature a piece that you have custom selected for yourself! If you have any questions or comments that you would like answered in the blog, go ahead and email us at sales@handmadewoodgifts.com and maybe well will answer your question in our next blog. We are already starting off the year with some special order pens and will be updating the website with some new items real soon too! So here’s to a safe, healthy, and prosperous New Year.